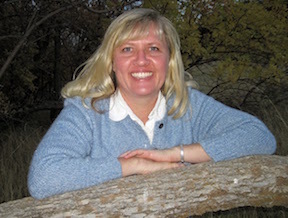 Ronda Gibb Hinrichsen is a romantic suspense novelist. She has also written for magazines and the internet. Some of her work appears under the name Kathleen Marks. Her titles include Unforgettable, Betrayed, One Fell Down, Missing, and Trapped. She wrote chapter books (The Prisoner of the Shadows, The Hidden Kingdom, The Mouth of the Dragon, and Heroes of the Highest Order). Her nonfiction works include 101 Pocket Writing Tips & Techniques and On the Go—A Writer’s Organizer & Journal. Ronda teaches about writing at conferences and in classroom settings. She contributed to With Wondering Awe. She has received several awards for her work, including first place in the 2009 League of Utah Writers Full Length Novel contest. She is a member of The Church of Jesus Christ of Latter-day Saints. This page was last edited on 29 May 2018, at 16:10.